Summit Youth Hockey head coach Chris Miller, right, speaks to members of the program's Bantam A team during game action earlier this season. Coaches and players with Summit Youth Hockey's Bantam A team pose for a photograph with the banner that recognized them as the 2019 Western Colorado Hockey League champions. Summit Youth Hockey Bantam A forward Finn Theriault and goaltender Kaeden Edstrom embrace during a game earlier this season. 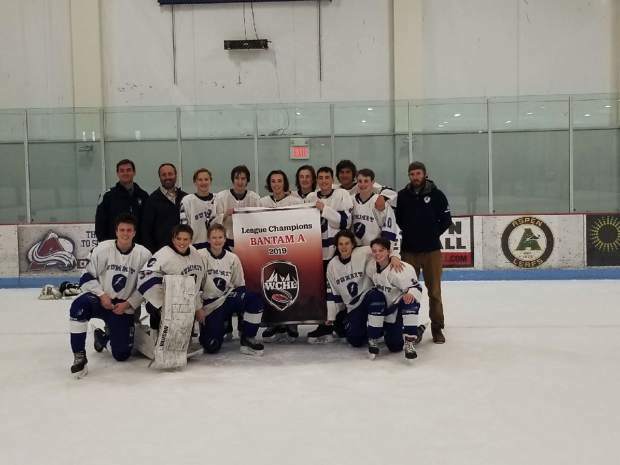 When Summit Youth Hockey’s Bantam A team won the program’s home tournament, the Kingdom Kup, at Stephen C. West Ice Arena all the way back in October, head coach Chris Miller knew the team could be on the verge of something great. After winning that tournament for the first time in 16 years, just how great remained to be seen. The squad answered that question in resounding fashion in the half year since, advancing as far as any Summit Youth Hockey team ever has: to the state championship game at the Pepsi Center in Denver, the same ice the Colorado Avalanche of the National Hockey League call home. 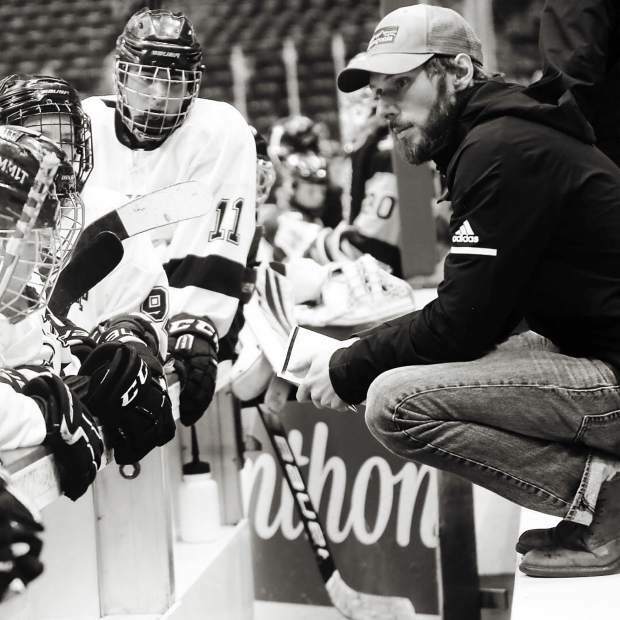 Back in September, Miller had full-well knowledge that this Bantam A group of 13-to-15-year-old hockey players was one of the best to come up through the program. After all, the core of the group had been together since they were 6-year-old mini-mites. Miller, who coached them in some capacity for the past five seasons, knew he had seven skilled returning players from the previous season’s Bantam A team. The 2017-18 team advanced to the semifinals of the 2018 Continental Divide Hockey League tournament. But that was all before Miller and the program received an atypical request from not only out of the county, but out of the state, as well. 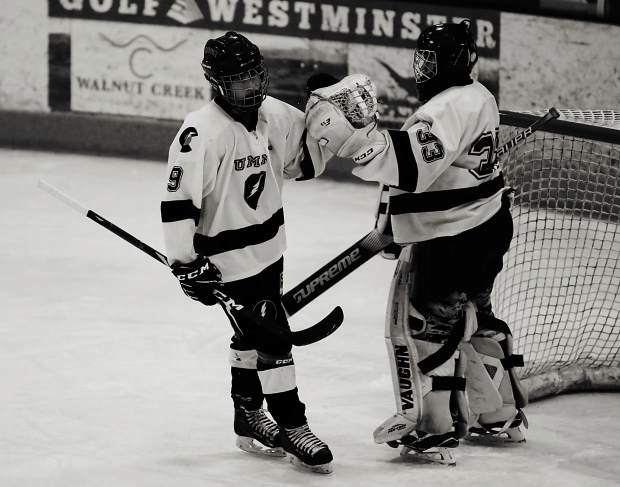 A young player named Dominik Griessmer from Great Falls, Montana, reached out to Summit Youth Hockey before the season expressing interest in relocating to Summit County for the winter to play with a Summit Youth Hockey club. Griessmer was looking for a higher level of hockey than what was presented to him in Montana, even if that meant he played up an age-division with older skaters. Miller, though, convinced the forward to play with his age-appropriate team, the Bantam As. Living here in Summit County with a “billet” — or host — family through the winter, Griessmer and his “grinder” approach, as Miller put it, soon seamlessly blended in with the team-centric spirit of the returning Bantam As when out on the ice. With the diminutive yet daring Griessmer in the fold, the Bantam As reeled off five wins en route to that October Kingdom Kup championship game victory over Littleton Red. The tournament title set the standard for a stretch where the Bantam As went 15-0-3 in regular season league play. From there, the Bantam As roared through a regular season where their high-tempo brand of hockey led them to wins in nearly all of their games. Their only losses in that stretch came at an elite-level tournament in Las Vegas over the Martin Luther King holiday weekend, when they played the best teams from both Northern California and Southern California. Miller said the experience in Vegas reminded the team of what they needed to improve on for the remainder of the season, which featured the Western Colorado Hockey League playoffs and, potentially, the state tournament. The Bantam As wouldn’t lose until that state title game. Along the way, Miller said goaltender Kaeden Edstrom continued to play well, a “rock” for the squad. Postseason play began in early March with the round-robin WCHL tournament in Aspen. Considering Aspen is historically the program’s archrival, the Bantam As knew how much a tournament victory would mean to the program. By the end of the competition, Summit rebounded from an opening 1-3 loss to Aspen to defeat them 3-0 in the finals. Miller said the team executed a plan to perfection to isolate certain players on the opposition. That wouldn’t be all for the team this season, though. Up next for the Bantam As was a state tournament competition that, for the first time in years, returned to a 100 percent merit-based selection process. The victory over Aspen solidified Summit as the top seed in the state tournament. After advancing through early round games in Arvada and Westminster, it all led up to the championship game versus Colorado Springs at the Pepsi Center. Though Summit defeated Colorado Springs earlier in the tournament, Summit lost 1-0 in the finals. Reflecting back, the loss didn’t come close to soiling the unprecedented success Summit’s Bantam As accomplished this season. It also, in Miller’s mind, doesn’t take away from the bright future the coach thinks this group will have at the next level, as 10 players will move up to the Summit Tigers high school program next year.